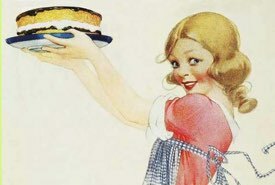 Enjoy these great cake recipes from Grandma's collection. 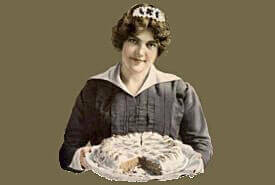 You can bake old fashioned dessert cakes that will delight your family and friends. They make a delicious change from modern cakes, especially the predictable store-bought kind that all taste the same. You simply can't beat the superior taste of a good homemade cake. The classic President's Cake (pictured above) is a luscious fruitcake that may be made for everyday family use without the fancy icing. But for those occasions when you need something really special, the fancy icing recipe is given. To make the President's cake, cut into small pieces and blend together 1/2 pound crystallized cherries, 1/2 pound crystallized pineapple, 1/8 pound orange paste or Turkish paste, 2-1/2 pounds raisins, and 1/2 pound citron, and soak overnight in 1/2 cup grape juice. Cream 1 cup shortening and 1/2 cup sugar. Beat yolks of 6 eggs very light with 1/2 cup sugar — combine the two; add 1/2 glass grape jelly, 2 teaspoons cinnamon, 1/4 teaspoon nutmeg, 1/4 teaspoon allspice. Sift 1 teaspoon baking powder with 1-1/2 cups flour and add alternately with stiffly beaten whites of 6 eggs; then 2 teaspoons melted chocolate. Sift 1 cup flour over fruit and add to beater; put in last 1/2 pound blanched and ground almonds, and 1/2 pound pecans. Place in 3 loaf cake pans (the sides and bottom of which are lined with fitted greased heavy brown paper). Steam slowly for six hours. Place in slow oven (250°F) and allow to dry out for an hour. This great cake recipe may be doubled exactly if a larger cake is desired. Makes 3 cakes in loaf pans 5 inches by 9 inches. This boiled icing recipe could be used for decorating other kinds of homemade cakes besides President's Cakes. Cook 2 cups sugar and 1 cup water until it forms a fairly thick drop from tip of spoon (222°F). Beat 4 egg whites with wire whisk. Gradually beat in 1/4 cup granulated sugar. Beat in 1/3 of the cooked syrup. Continue to cook the syrup until it threads very fine (230°F). Add another third of the syrup to the egg whites and beat in very thoroughly. Cook the remaining third of syrup until two drops fall at once from the spoon (250°F). Beat it into egg whites. Add 1/2 teaspoon baking powder and 1 teaspoon lemon juice. Cook over hot water, folding it over, but not beating, until thick enough to pile high without spreading and sinking. Cool. When ready to use on cake, fold it over carefully until smooth and creamy. Makes about 1-1/2 quarts icing. 3-1/2 cups all-purpose flour, 2 teaspoons baking powder, 2 eggs, 3/4 cup shortening, 1-2/3 cups milk, 2 cups white sugar, 1 teaspoon vanilla, 1 teaspoon lemon, 1 teaspoon salt. Divide batter in half and color one half pink. Line 9 greased layer cake tins. Swirl batters in pans for marble effect. Bake 25 minutes or until done at 350-375°F. Very good. For Making 1/2 Recipe: 1-3/4 cups all-purpose flour, 1 teaspoon baking powder, 1 egg, 1/3 cup shortening, 3/4 cup milk, 1 cup white sugar, 1/2 teaspoon vanilla, 1/2 teaspoon lemon, 1/2 teaspoon salt. Whites of six eggs, one cupful of sweet (whole) milk, two cupfuls of sugar, four cupfuls of sifted flour, two-thirds of a cup of butter, flavoring, and two teaspoonfuls of baking powder. Stir the sugar and butter to a cream, then add the milk and flavoring, part of the flour, the beaten whites of eggs, then the rest of the flour. Bake carefully in two tins lined with buttered white paper in a moderate (375°F) oven for about 25 to 30 minutes. Test with wire for doneness. 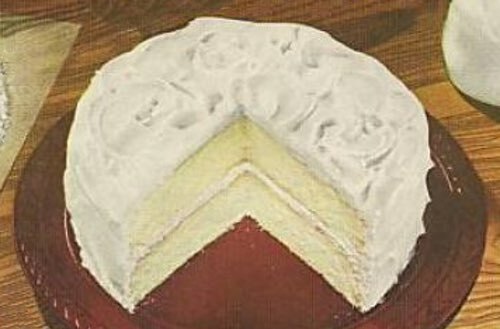 Spread white frosting between layers and on top and sides of cake. Keep this great cake recipe handy for when company is coming. 1 scant cup sugar, 1/4 cup butter, 1/2 cup milk, 1-1/2 cups flour, whites of 2 eggs, 2 teaspoons baking powder, a little vanilla; cream butter and add gradually the sugar, then milk, flour, and baking powder; last the beaten whites of the eggs and vanilla. One cup brown sugar, 1 heaping tablespoon butter, 3 eggs (saving out whites for frosting), 1 teaspoon pastry spice, 1/4 cup corn syrup, 1 small teaspoon baking soda, 1 cup biscuit crumbs. Line a pan with pastry and put mixture in, and bake 20 to 30 minutes. For Chester Cake Icing: Beat white of eggs stiff, add 2 tablespoons of brown sugar slowly; put on cake when cold. One cup sugar, butter size of an egg, 1 egg, 1 cup sweet milk, 2 teaspoons cream of tartar (level), 1 teaspoon baking soda, 1 pint flour. Beat sugar and butter together well. Add other ingredients. Pour into buttered tin two-thirds of mixture, and to remaining third add: 2 tablespoons molasses, 1/2 teaspoon ground cloves, 1/2 teaspoon allspice. Stir together, and pour over top of first mixture. Bake in moderate oven. This is a great cake recipe if you love cakes with an old time spicy flavor. 1. Preheat oven to 350 degrees Fahrenheit. Grease and flour a 9x13 inch pan. Sift together the flour and baking soda; set aside. 2. In a large bowl, combine eggs, 1 cup white sugar and pineapple with juice. Beat in the flour mixture. Pour into prepared pan. Sprinkle brown sugar over top of batter. 3. Bake in the preheated oven for 40 to 45 minutes, or until a toothpick inserted into the center of the cake comes out clean. Remove from oven and prick top with a fork. Pour on topping while still hot. 4. To make the topping: In a small saucepan combine the butter, evaporated milk, 1 cup white sugar, and 1 teaspoon vanilla. Cook over medium low heat, stirring occasionally until sugar is dissolved. Mixture will be thin. Pour over hot cake. Does this great cake recipe make a cake or do you call it a pudding? You decide, but it IS delicious! Spread cherry filling evenly in 13x9x2-inch pan. Arrange pineapple chunks, sprinkle cake mix evenly over top. Cover with melted butter and top with coconut and walnuts. Bake 1 hour at 350°F. Can be served warm or when cooled. This is a great cake recipe for those times when you don't feel like baking with a hot oven in the hot summer weather. Line a deep pan with waxed paper. Cover bottom and sides with lady fingers — brown side out. Melt chocolate in double boiler, add sugar, water, dates, and beaten egg yolks. Cook, stirring frequently, until chocolate is smooth, and dates are soft. Cool, add flavoring and nuts and fold in stiffly beaten egg whites. Pour one half of mixture into pan, cover with layer of lady fingers and add remainder of filling. Cover with waxed paper. Chill for several hours. To serve, remove from pan and top center of cake with whipped cream. Sprinkle with colored sugar or chopped nuts to decorate. Try these puffs and you'll make them often. Heat the water and shortening in saucepan until they boil up well; add flour, sifted with salt, all at once and stir vigorously. Remove from the fire as soon as mixed; mix in unbeaten eggs one at a time as soon as mixture has thoroughly cooled. Add baking powder; mix well and drop by spoonfuls one inch and a half apart on a greased tin. Make round with a wet spoon. Bake about 25 minutes in a hot oven. With a sharp knife, cut near base to admit the filling. This is also a good filling for layer cakes. Mix the dry ingredients; add the egg slightly beaten and stir into this gradually the scalded milk. Cook for about fifteen minutes in double boiler, stirring constantly until thickened. Cool slightly and flavor. 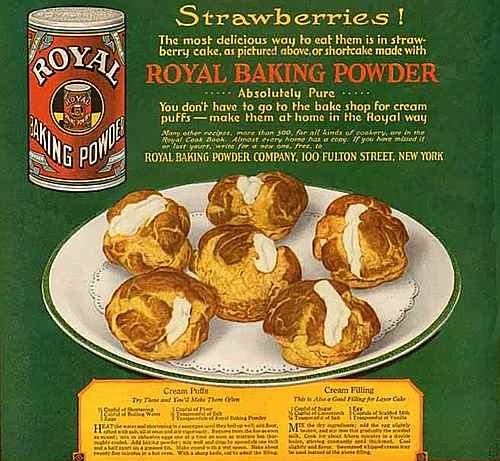 Sweetened whipping cream may be used instead of this cream filling. One cup sugar, two eggs, two tablespoons softened butter and four of milk; beat all well together, add a cup of flour in which has been mixed teaspoon cream of tartar and half teaspoon soda. Bake in rather small square pan. You'll want to try the classic triple-layer president's cake, the old fashioned feather cake, and the traditional English Chester dessert cake. You'll find they will brighten any special occasion. There's nothing like a vintage cake! Enjoy making these great cake recipes from Grandma's collection. And did you know there are dozens and dozens of old fashioned, scratch-made cake recipes featured elsewhere on this website? Be sure to take a peek!